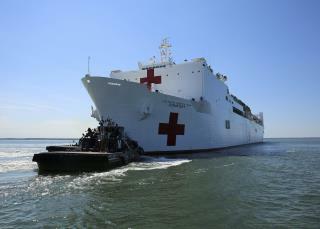 (Newser) – After Hurricane Maria, the USNS Comfort was sent to Puerto Rico, where the floating hospital has been idling offshore for almost two weeks. But CNN reports that only 30 or so of the ship's 250 available beds are occupied, and that its surgery facilities, medical staff, and supplies have barely been tapped, all due to confusion and red tape on transporting hurricane victims to the vessel. The issues seem to revolve around the protocol in getting patients onto the ship—which Hillary Clinton referenced on Twitter last month, urging the US government to send it to Puerto Rico ASAP. Patients apparently have to be referred by the territory's Department of Health, and the referrals haven't been coming, as medical staff don't seem to know exactly what to do. "The disconnect or the apparent disconnect [is] in the communications flow," Ricardo Rossello says, vowing to overhaul the process. Hillary Clinton didn't have to urge anything. It was already in motion to send the ship. The reason for the people not getting help comes back to that idiot mayor who keeps trying to make it look like Trump is the reason for all their problems when in reality she is the one causing the trouble for the people she is supposed to be serving. Trump (groper in Chief) doesn't have the ARM to throw paper towels from the ship to land.